The FOMC at least still knows how to throw a party. It may not be what it once was, but for one day there was the familiar euphoria predicated upon the wish that central bankers might know something about anything. All-too-quickly, however, it vanished as it becomes increasingly clear, despite all attempts to rewrite this history, that there are no answers. After but a day, reality rudely intruded on the recovery, perhaps suggesting that it was the simultaneous recession announcement people are now more attuned to. U.S. stocks dropped Thursday on persistent concern over faltering global economic growth, led by declines in energy and materials shares, a day after shares had rallied on the Federal Reserve’s decision to raise interest rates. The selloff continues so far this morning as global, for once, means global which includes the US much to the dismay of the mainstream that still clings to the idea that the US economy is in primary condition for overheating. 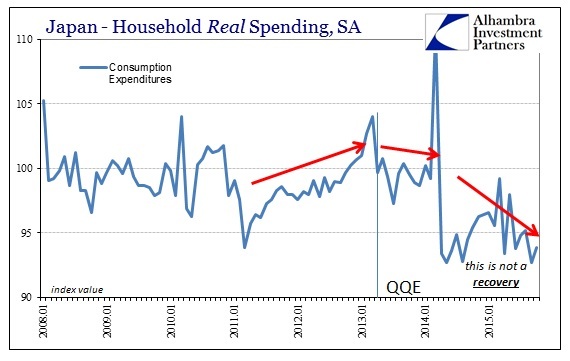 The dichotomy remains simply how it defined QE’s influence; “stimulus” is assumed to be stimulative, so at the end of it the intended target must have been stimulated even when it doesn’t show it. Therefore, according to orthodox mythology, if that isn’t truly apparent it only means it is about to be. In Japan, however, this mysticism is contrarily naked. 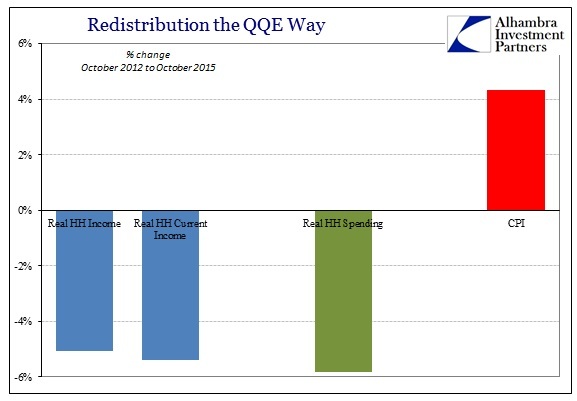 Redistribution and “inflation” suggestions are revealed in all their gruesome horror. 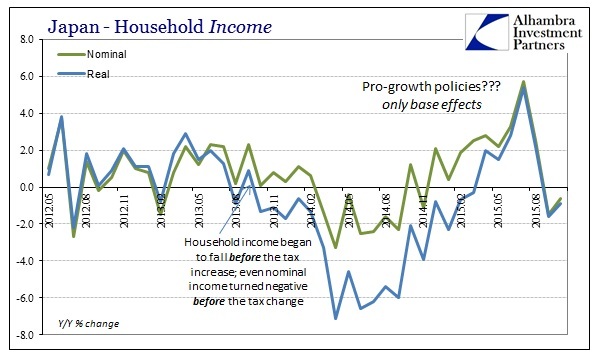 The Bank of Japan has no plausible outlet for “overheating” since the entire Japanese economy is a gaping wound; Japanese households most especially. Further, as to leave little doubt about any of it, that hole in the Japanese economy coincides exactly with what the Bank of Japan infuriatingly claims will heal it. 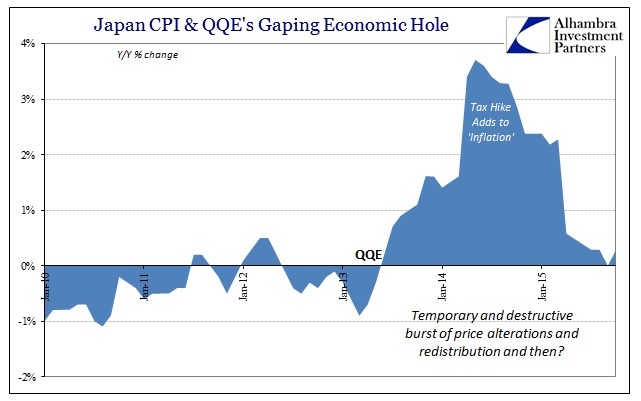 As QQE has had an obvious influence on the yen, and thus consumer prices more directly than what the Fed can influence and conjure, there is yet no “pump priming” effects visible anywhere, only clear devastation. 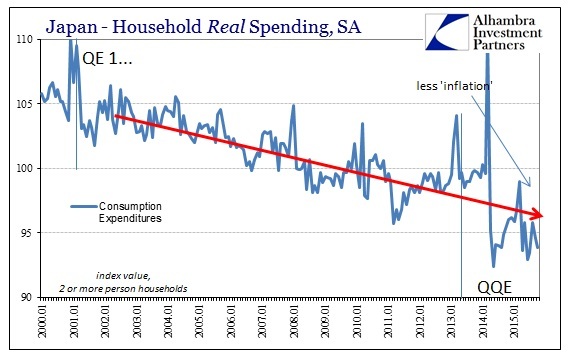 Both Japanese Household Income and Japanese Household Spending, real and nominal, are declining again. That’s an undesirable outcome all its own, but given the huge declines in 2014, renewed contraction is evidence of monetary cancer. 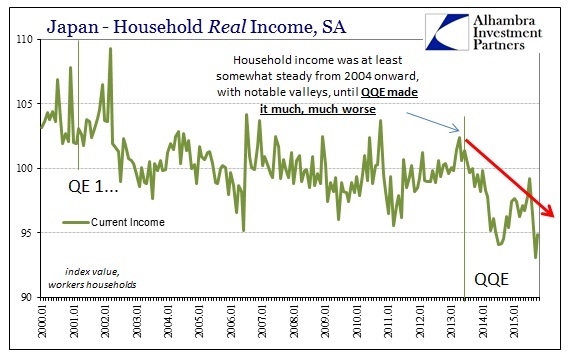 Nominal household income in October 2015 was only 0.67% more than October 2012, the year prior to QQE’s introduction. Again, that is nominal income, meaning that it has remained flat without any influence whatsoever by the forces of redistribution that are supposed to at least push nominal factors upward. Nominal DPI likewise is barely positive compared to October 2012, up just 0.95%. 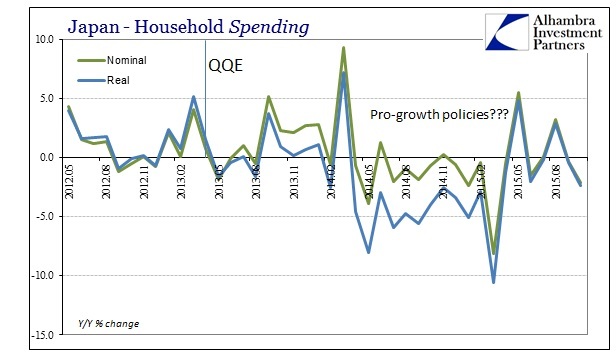 Spending, however, even in nominal terms remains slightly less than October 2012, down -0.6% over three years! That suggests Japanese Households are being very careful about the fact that incomes have stagnated – and with good reason. Once you factor in consumer prices, Japan’s QQE-led recession is a foregone conclusion. Despite the clear absence of even nominal growth in income or spending, consumer prices according to the CPI are up 4.3% in those three years. Therefore, in real terms, the Japanese are left much worse as by that simple math incomes and spending over a three-year period are significantly lower. Mercifully, consumer prices have taken a break much of this year but rather than realize the error, policymakers, orthodox economists and the media are uniformly critical of the Bank of Japan, not for what they have already wrought but that they aren’t doing more of it. This is not the definition of insanity, it approaches criminal neglect. To critics, the BoJ missed its best opportunity to ease when in October it delivered new, downgraded forecasts for inflation and the economic outlook. Its decision not to loosen monetary policy then has since received some vindication, however, with a few positive surprises in subsequent data. That is an otherworldly paragraph; simply astounding given the actual economic conditions in Japan. Those calling for even more inflation are “vindicated” because Japan’s economy has gotten worse? It’s as if all prior QE’s, and there were almost too many to count (though I have tried, below), never happened. The current recession in Japan, which is picking up in its depressive tendencies, is just assumed to have come up out of nowhere like Godzilla arising from the underworld. The opposite is obviously the case, as again the timing of the depression matches in every way QQE’s imposition. It has made the Japanese people much, much poorer and that erosion in the very fabric of true economic condition is what the current recession is all about. 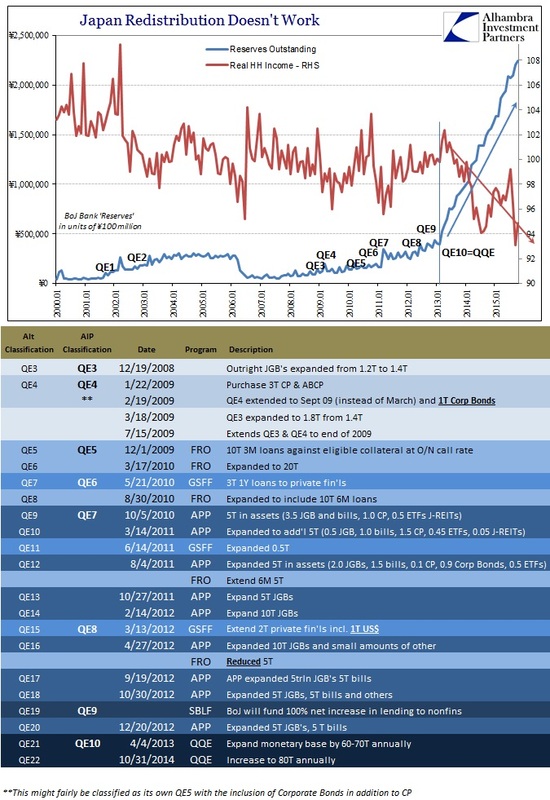 QE and QQE’s all have the same apparent multiplier, and it is unambiguously negative – “inflation” just doesn’t do what monetarists think it does. And like that, the Federal Reserve declared both a boom and recession on the same day. Markets, such that there are any left of them, are no longer so amused and captivated by mere words. 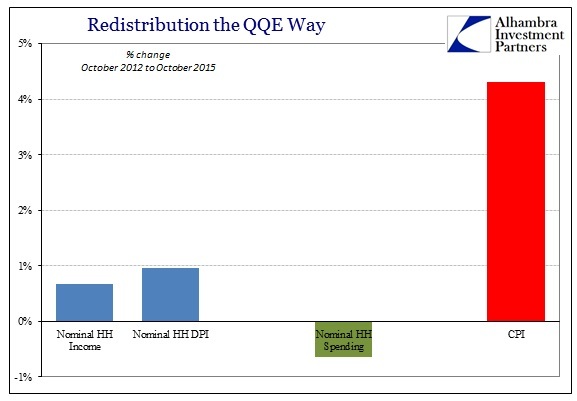 You can only say that QE works for so long before it has to actually do so. Some places offer more gray, statistics and conditions (junk bond bubble) that obscure accountability in this manner affording monetarism more leeway with which to carry out their farce. More and more, however, the global economy is removing itself from the monetarist spell; what is abundantly obvious in Japan is become more so everywhere else, including the US. It just doesn’t work and that leaves the global economy not just precarious because of the last “cycle” but further and highly impoverished for the (repeated) attempt(s). With a seriously eroded economic foundation and no monetary magic left with which to support what remains, what comes next? The question perplexes now much more than Japan.